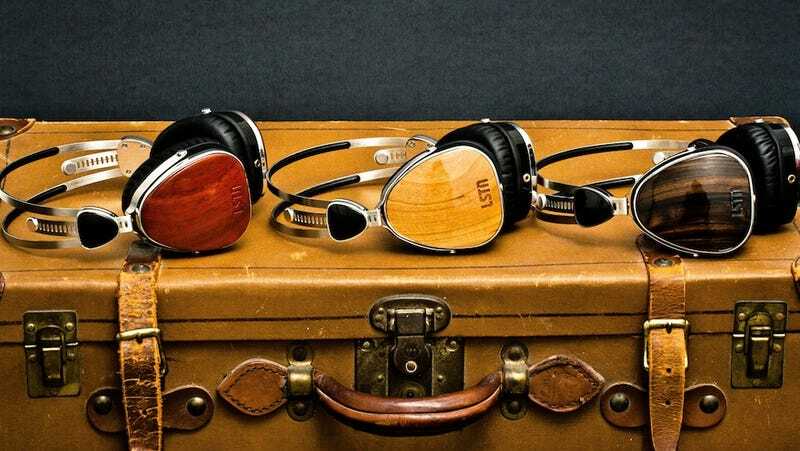 LSTN is the brainchild of Bridget Hilton, a music industry veteran who was on a road trip through a redwood forest when she came up with the idea of making headphones out of wood. As a longtime guitar and piano player she could clearly comprehend the acoustic appeal, and from an aesthetic point of view she could imagine a truly unique product. So she found a local furniture manufacturer and cut a deal for some beech wood, cherry wood and ebony scraps that got shaped and polished into headphones. So far, pretty standard stuff. But then Hilton partnered up with Joe Huff, a social enterprise buff, so make sure that LSTN wouldn't just be in the headphone business. They would also be helping the hearing-impaired around the world. A portion of the purchase price for each set of LSTN headphones goes to the Starkey Hearing Foundation, a global organization that's committed to providing 100,000 hearing aids a year to those that need them. While she wouldn't disclose exactly what percent of the price goes to charity—she did say it was a "significant amount" of gross revenue—or how many hearing aids the Starkey Foundation had given out on her company's behalf, Hilton did say that giving back was just as important to her as selling a product. She cited Tom's Shoes as part of her inspiration for the model. You've probably seen the other piece of inspiration: a viral YouTube video of a 29-year-old woman hearing her voice for the first time. "It's a very transformative thing," Hilton said, "when you see someone who's never heard themselves speak and all of a sudden they can hear it's incredible." And if they're doing their job, the team behind LSTN should be providing this experience to thousands of people every year. It's too bad they won't share exactly how many people they're helping—the Tom's one-for-one model really is remarkable—but LSTN's certainly helping more hearing-impaired people than Dr. Dre. For now, LSTN headphones come in two models: the chrome Troubadours and the folding Fillmores. They're accompanied by a line of earbuds called the Bowerys which are, impressively, also made out of reclaimed wood. All of the models come with a microphone and controller so that they work with smartphones and music players. The headphones are sold through the LSTN website for $150, $100 and $50 respectively and are scheduled to make their retail debut at Whole Foods in August. And how do they sound? Pretty amazing, actually, especially for the price. LSTN sent me a pair of the cherry wood Troubadores a couple weeks ago, and I haven't really taken them off my head since. The sound is clear and full both in the high and low ranges, so the new Daft Punk album sounds as grand as the nerdy cello music I put on to relax. This is the point, Hilton later explained to me. "A lot of headphones are made to sound good in one genre [like] hip hop or something," she said. "For ours, we want them to sound good on any genre. We want to appeal to the general music fan." Mission accomplished.